Global Body’s new paint line is a total system. The all new state of the art computer controlled wash, dry, paint and cure equipment was designed specifically for us to ensure our customers obtain product that is superior. 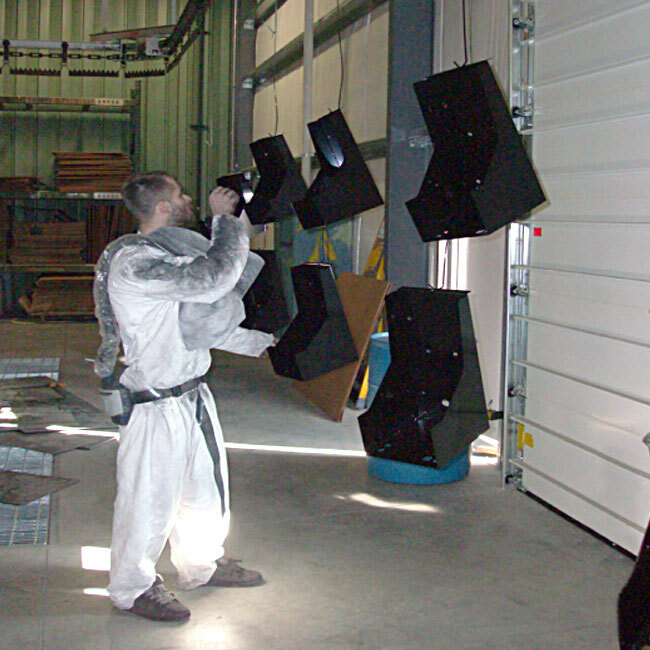 The system is sized so we can paint parts as large as 9 feet tall, 9 feet long and 3 feet wide. 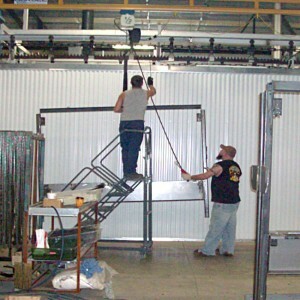 This new system is contained in a brand new building designed specifically for the painting system. 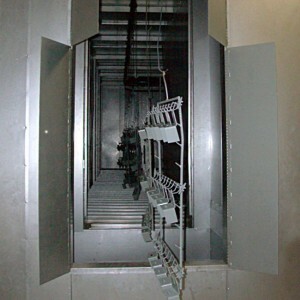 The pictures below give you an indication of what we are able to do. We would love to show off it’s capability and invite any prospective or existing customers to come and see it first hand. 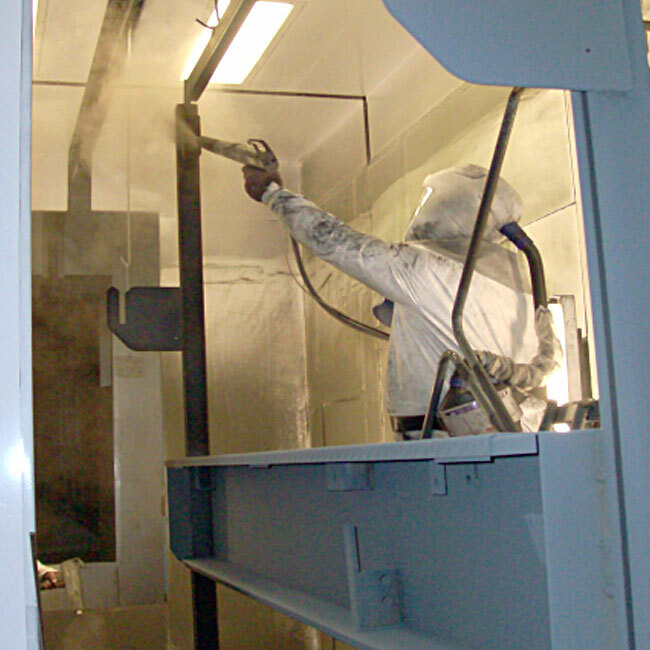 Our newly developed paint production process allows us to provide primered and top coated products for you that will surpass 1500 hours of salt spray testing. If you have product that has to endure the conditions presented by road salt and various temperature and weather extremes you need to check us out. 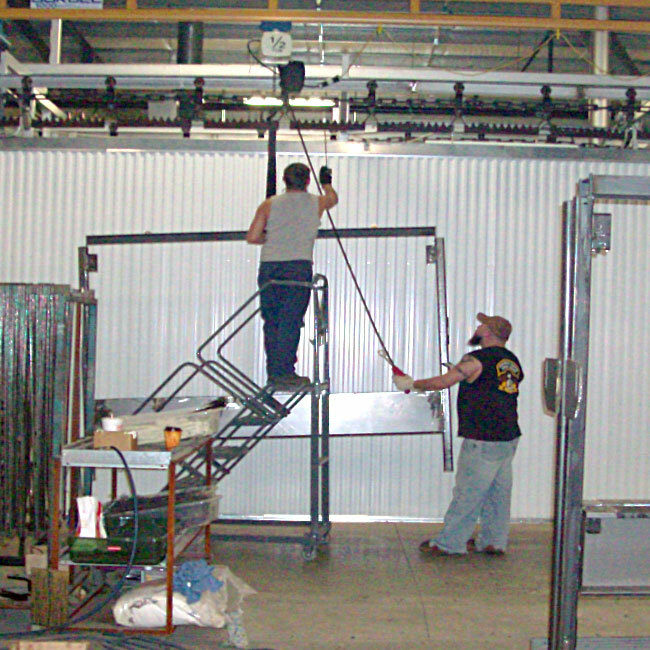 Parts are hung on the continuous overhead conveyor with the use of overhead cranes. 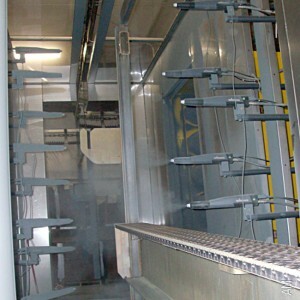 The six stage washer is 90 feet long and has 6 stages. 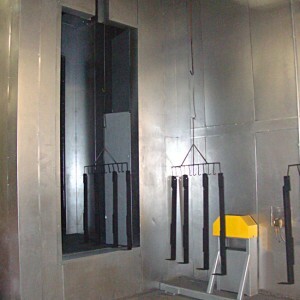 Once the parts are throughly washed they are dried off in an oven that is 70 feet long. The 350 degree oven thoroughly dries the part in preparation for paint. Parts that require primer are then routed through an automatic booth. 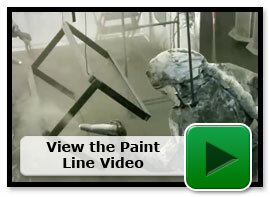 We apply a 1 to 2 mil coating of zinc rich primer using a set of 18 automatic applicators. A light curtain at the entrance of the booth senses the part and its size so only the applicators needed to cat the part are actuated. Parts then enter another booth for top coat application. This top coat is manually applied to the thickness specified by the customer. Global Body is able to apply most any color the customer chooses and these color changes are done quickly through a state of the art color select system. 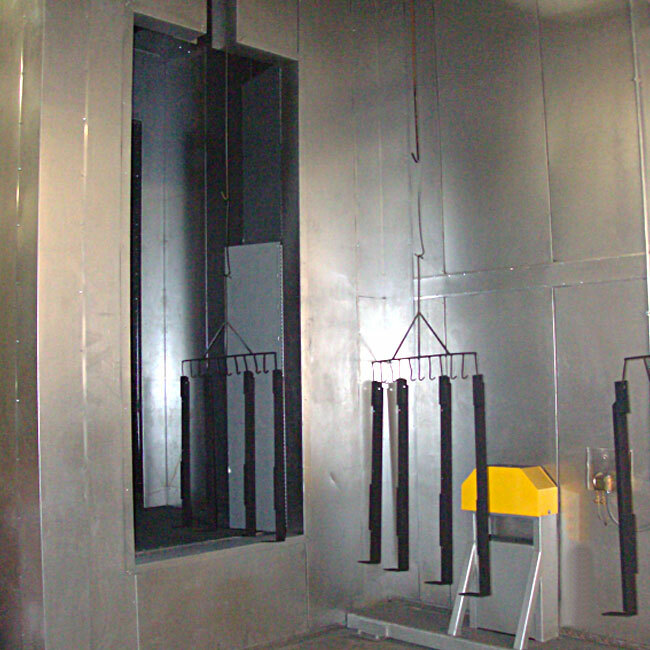 After parts have the powder applied they enter the cure oven. Parts are exiting the cure oven. 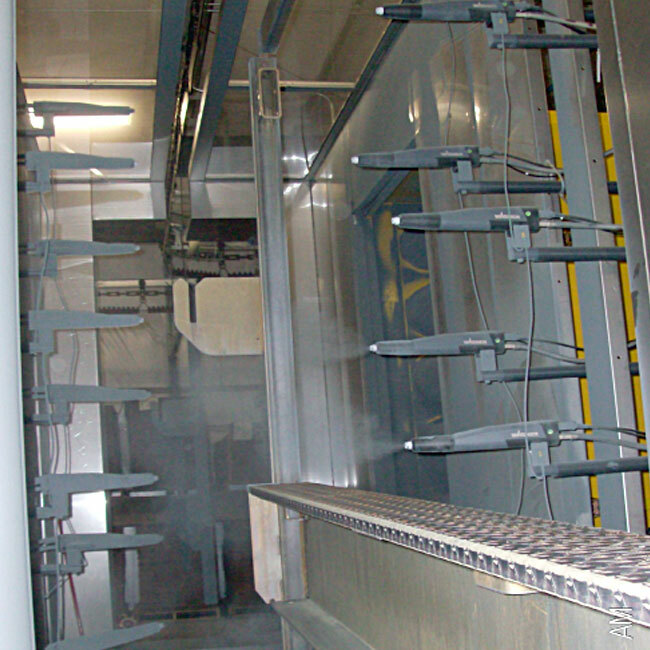 The 220 feet of conveyor line allow the parts to be in the oven for 40 minutes. 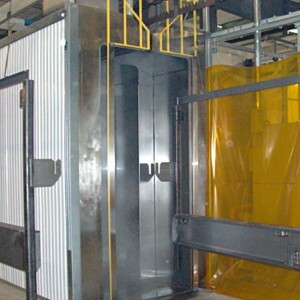 This time and tempurature controlled oven allows us to paint parts from a very thin sheet metal upto 1-1/2 inches thick. After the parts exit the cure oven they travel back to the load/unload area. 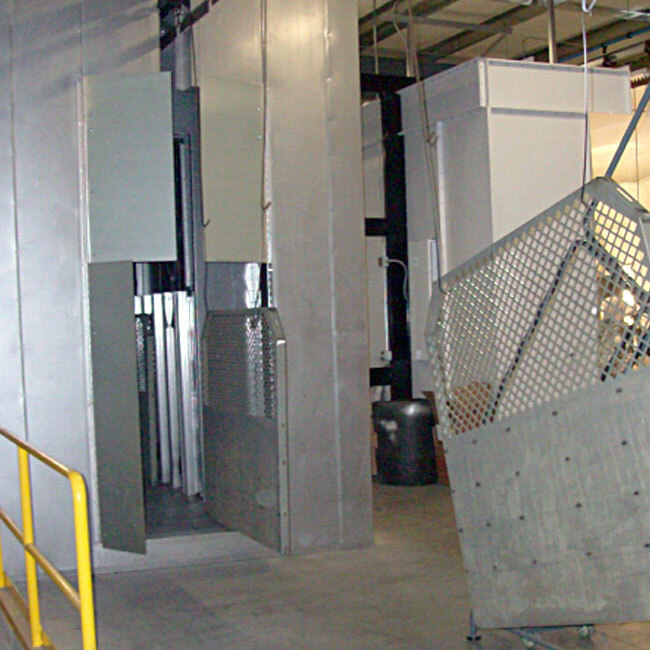 This gives the parts time to cool down so they can be handled, inspected and packaged for shipment. The whole process from start to finish takes about 2-1/2 hours.